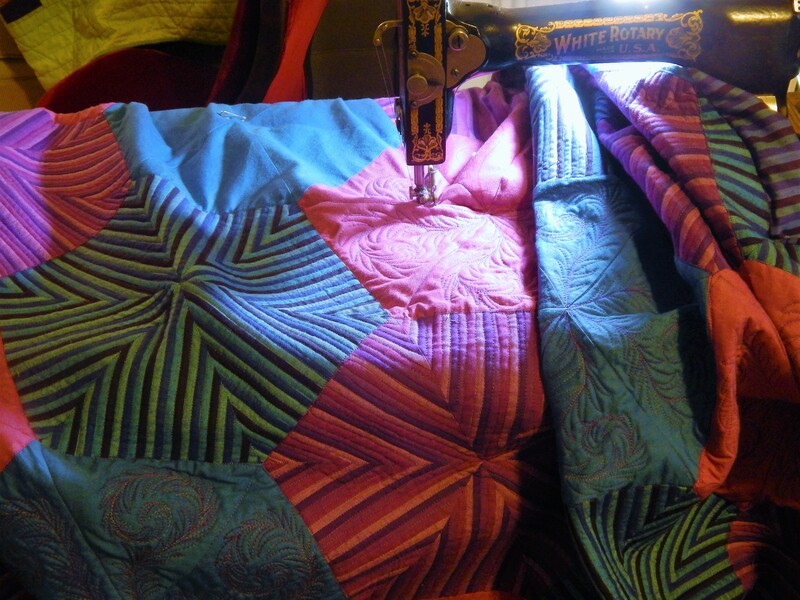 I have been working on the sashing for the Suspension Bridge quilt. 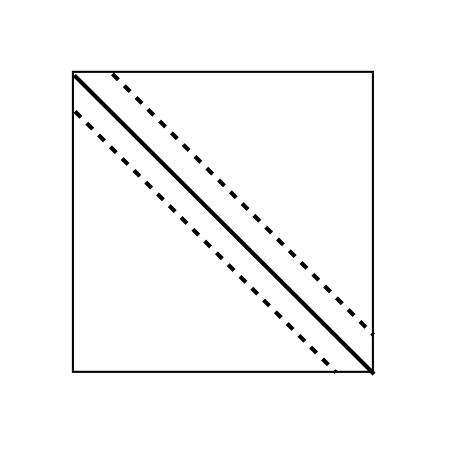 It takes a lot of half square triangle units (24 for each section). There are lots of ways that I have seen to make these units. 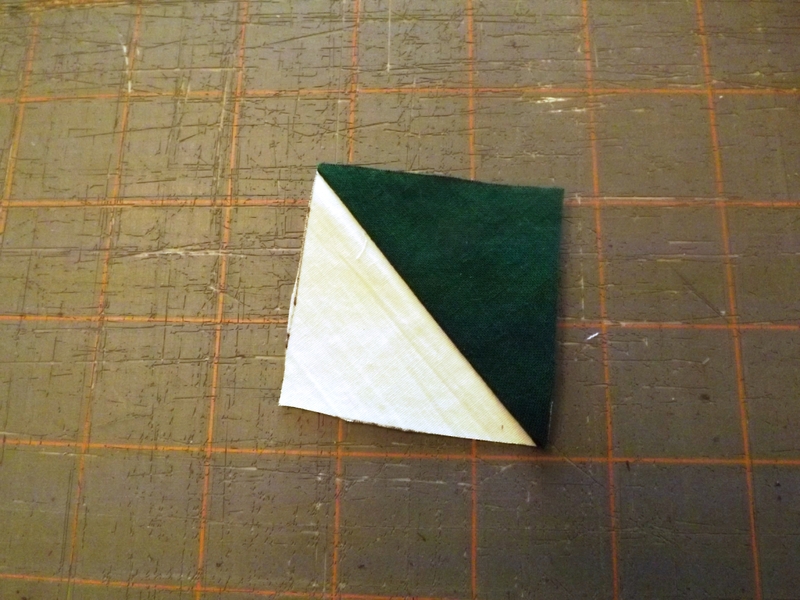 The most common seems to be to stack 2 squares together, draw a diagonal line in the center, sew 1/4″ from either side of the line. Then cut down the line, then press them open and then cut off the dog ears. This requires a lot of time. First you have to cut all the squares, then mark them then sew 2 seams on each group, then press each unit individually and then trim them. I decided to do it differently. This is the unit I am making. Here is How I did it. 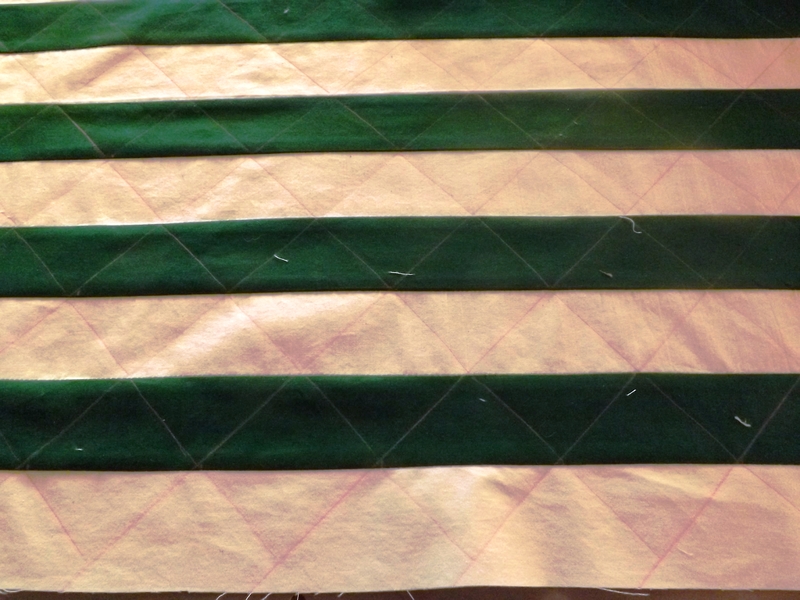 First I cut strips of fabric , sewed them together and pressed. 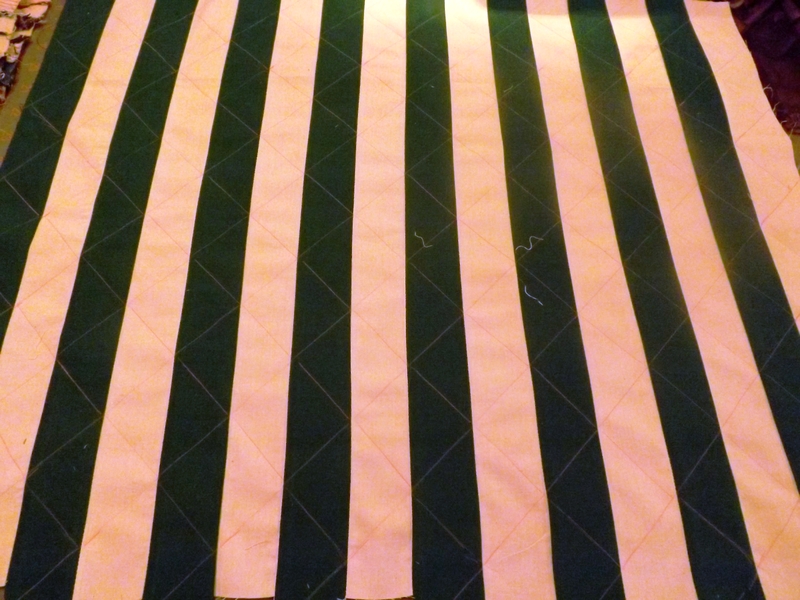 For this project the strips are 2″. 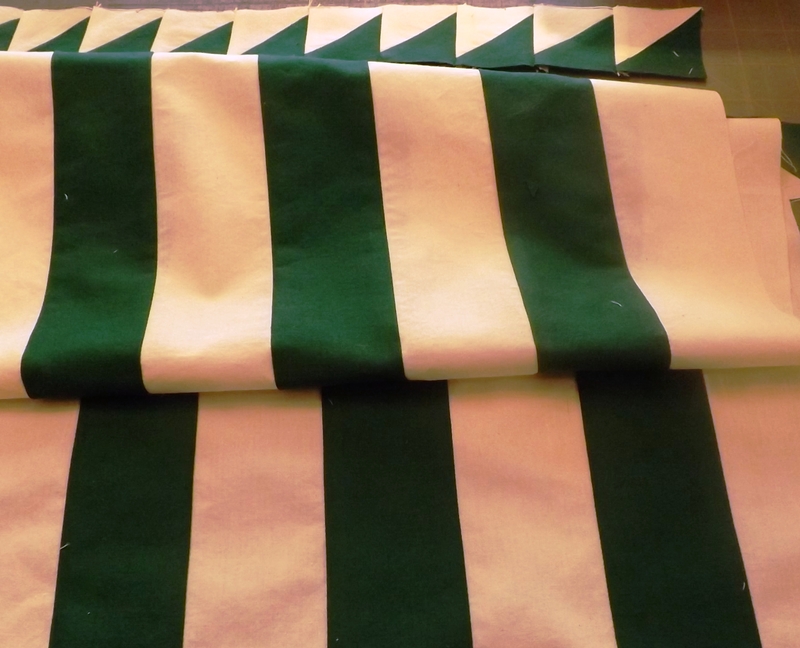 I cut 8 green and 8 white and sewed together (15 seams) and pressed the seams to the dark fabric. Next I drew a 45 degree line through the center and then marked each unit off of that line (if you are very careful about your measuring and cutting you could skip the making and just cut with the rotary cutter and a ruler. Now just line up the ruler on the marked line and cut them apart. I got 90 units from those 15 seams and one pressing. once they are cut apart they are done, they do not need any more pressing and they don’t need trimming, all the dog ears are cut off when you cut them apart. and then add to the quilt. 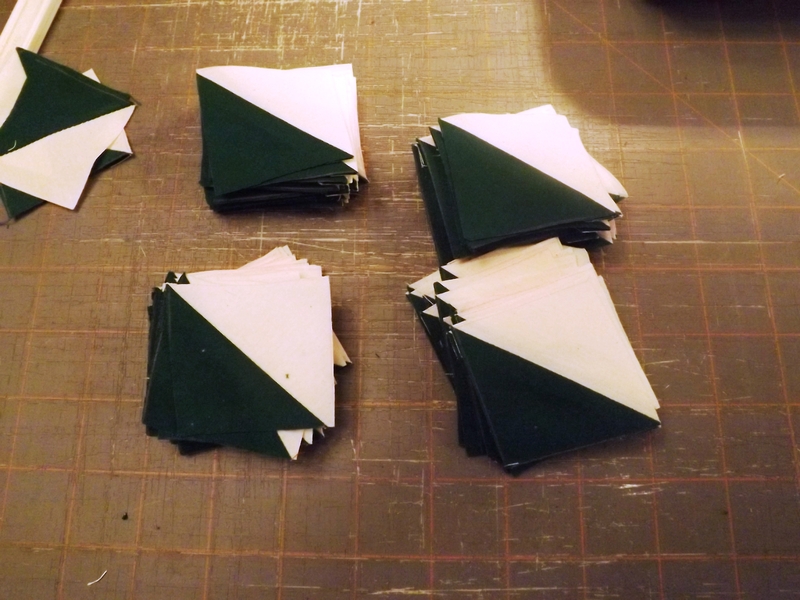 This quilt will have 31 of these sashing pieces, and each of those has 24 triangle units so I need to make 744 units. It seems like less of a big deal this way. 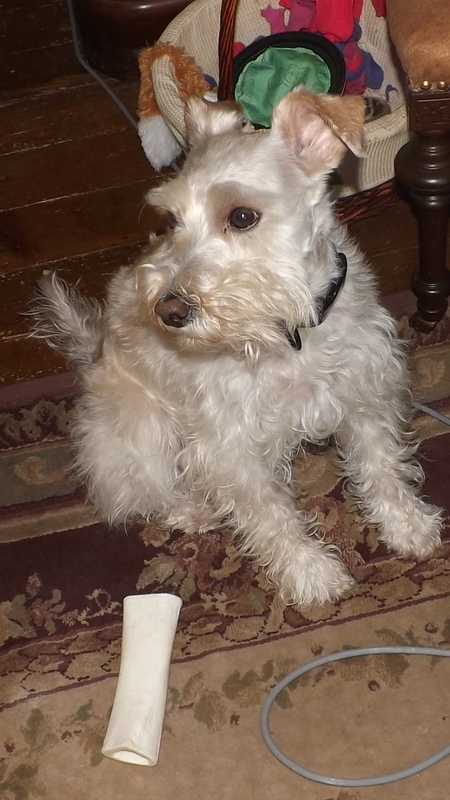 Teddy has been watching…and wondering why I keep putting this on the floor in “his” space. In other developments I have a Robins nest in the yard again this year. She decided that the front porch would be a good spot and gets mad every time someone goes out there….I think the mail man is more afraid of the Robin than he is of the dog! 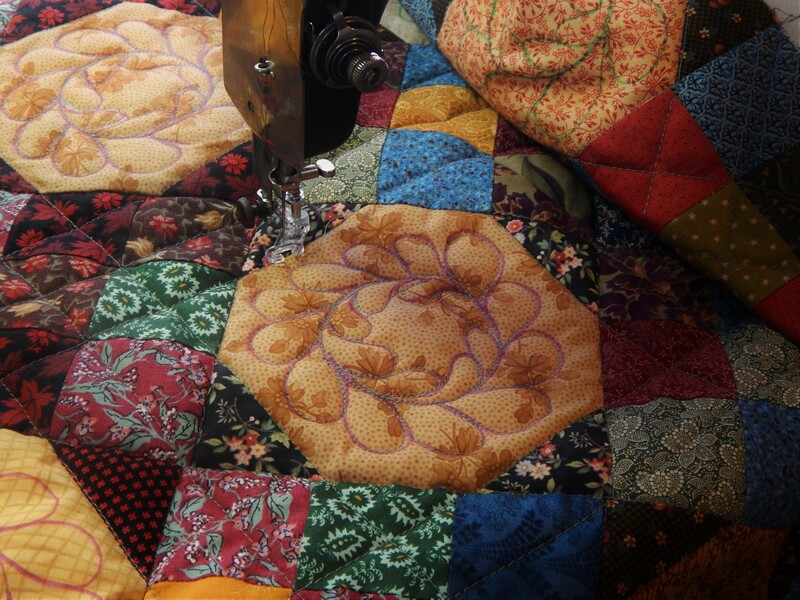 This entry was posted in Quilts and tagged Half square triangle unit, Quilting, Quilts. Nice way of making half square triangles! Robins everywhere, but the wrens are the mean ones, we have them everywhere and they dive at the cats and anybody in the way. They have chased the bluebirds out of their boxes, they rule the world around here! Bu they are all playing in snow this morning…soon to melt? Only a few wrens around here….but they are loud when they show up!….hope your snow melts soon!! Wow! What a great way to do half square triangles. What a great way to save time! I hope it work for you! It took me a few trys to get the right measurements. But after that it was easy! Wow- great tip for HST! 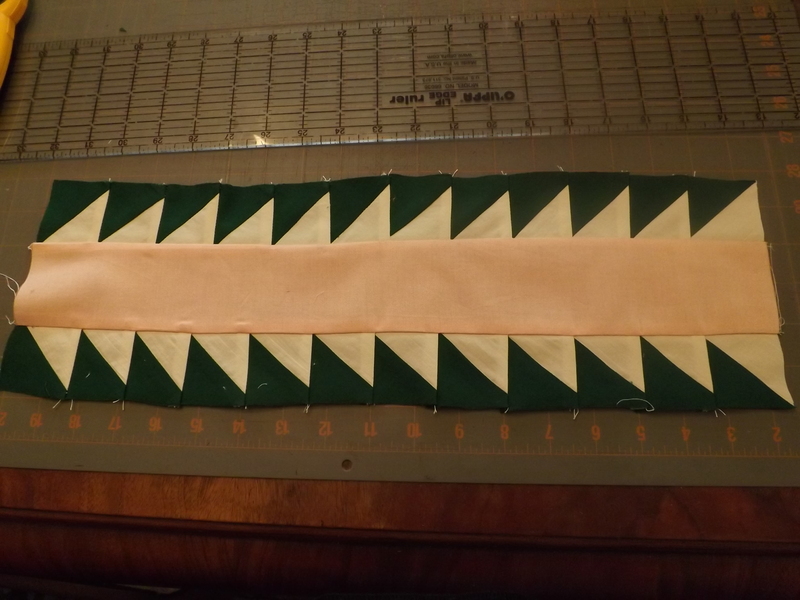 I think the only down side of doing hsts this way is that the sides are now on the bias, correct? But if that doesn’t cause any problems, it sure saves a lot of time. I will have to try it. Thanks for the tutorial! This is MUCH easier than the method I was taught. I’m with Carla–brilliant!! thanks! 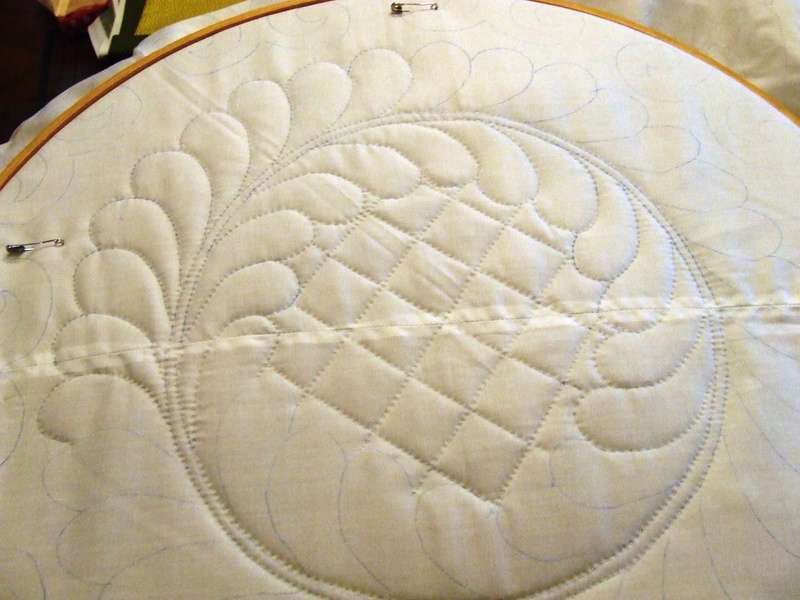 I think It is a lot easier….just makes the bias on the outside edge. I love the way you can make tasks easier and less boring and tedious. You just amaze me. Have you thought of doing a book? I really think you should. I would love a book I could refer to with all the neat processes you’ve passed along to us in the few months I’ve been following you. Get right on that, would ya? You would also need a few pictures of your quilt inspector in the book. I love that dog! I’ve seen that method before. I suppose you have to be very precise, but the outcome looks very worthwhile! Love how this quilt is coming along! 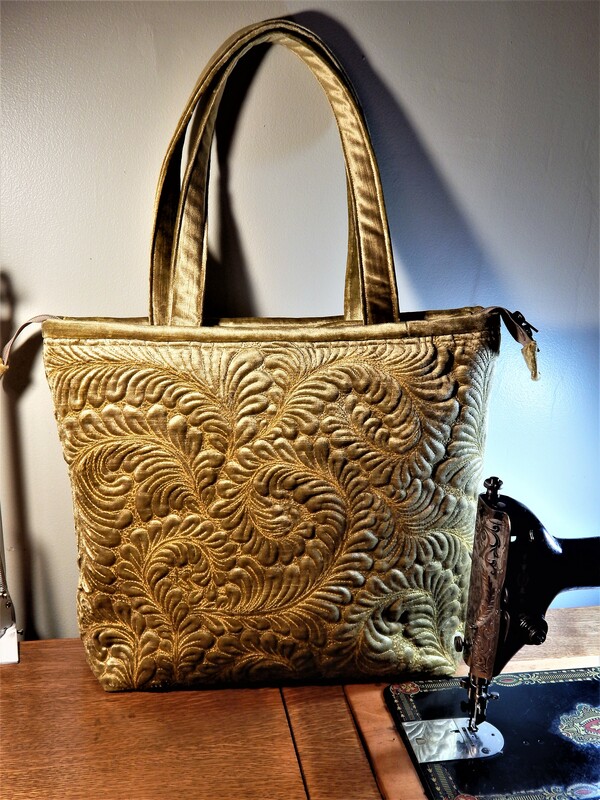 The 1st time I saw the technique was in Judy Martin & Judy Hopkins 1990s books published by That Patchwork Place. I’m looking forward to giving this a go, and I am relieved to read it took you a few practices to get it right. It reassures me perseverance will pay off. Thank you for sharing. Brilliant. Unfortunately, this new technique will only serve to fuel my existing HST obsession. I absolutely love the HST cutting tip! 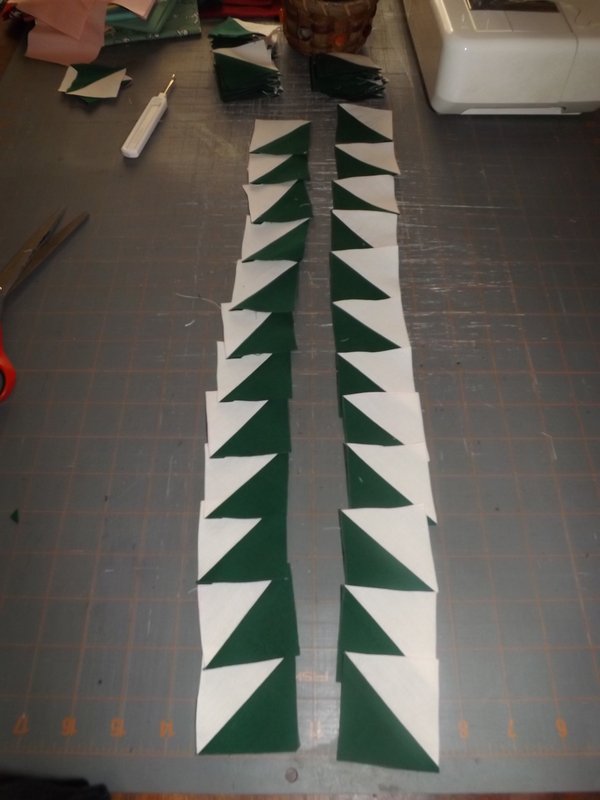 When I cut the original strips I cut them on the bias so the squares finish on the straight of grain, however, I cut the squares individually – I am going to try this! Thank you! Thank you! Thank you! What a brilliant way to make the half squares, I’ll give that a try, thanks again for sharing all these tidbits.